How do I print with black ink from Windows or my Mac when a color cartridge is expended? When a color ink cartridge is expended, you can temporarily continue printing from your computer using black ink. Replace the expended color cartridge as soon as possible for future printing. To temporarily print with black ink, see the instructions below. If you see a message during printing telling you that you can temporarily print in black ink with an expended color cartridge, you can cancel your print job and select settings to print on plain paper or on an envelope. Note: To use this feature, Epson Status Monitor must be enabled. Note: While a color cartridge is expended, you cannot print faxes, make copies, or print from Epson Connect or a mobile device. Click Cancel or Cancel Print to cancel your print job. Note: If the message screen appears on another computer on a network, you may need to cancel the print job using the product control panel. Load plain paper or an envelope in your product. Access the print settings in your print application. Select Plain Paper/Bright White Paper or Envelope as the paper type setting. Print your document. Epson Status Monitor 3 displays a print message. Click Print in Black to print your document. 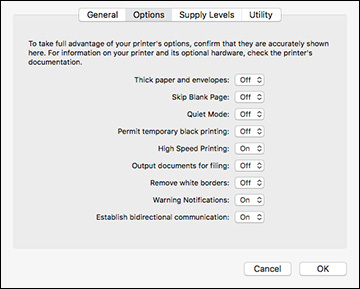 If printing stops, you can cancel your print job and select settings to temporarily print with only black ink on plain paper or on an envelope. Click the printer icon in the Dock. If you see a message telling you that you can temporarily print with only black ink, click the Delete or button to cancel your print job. If you see an error message, click OK. In the Apple menu or the Dock, select System Preferences. Select Print & Fax, Print & Scan, or Printers & Scanners, select your product, and select Options & Supplies. Select On as the Permit temporary black printing setting. Click Print to print your document.